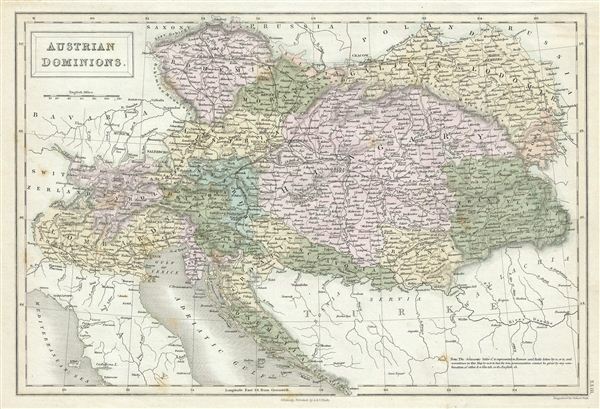 This is a fine example of Adam and Charles Black's 1851 map of the Austrian empire. The map covers the territories claimed by the once vast Austrian empire, including in whole or part the modern day nations of Austria, Hungary, Germany, Italy, Albania, Croatia, Romania, and the Czech Republic. It also includes parts of Turkey, Switzerland, Germany, Russia, Prussia and Poland. The Austrian empire, founded in 1804 by the last Holy Roman emperor, Francis II, lasted only till 1866. It was transformed into the Austro-Hungarian empire after Austria was defeated in the Austro-Prussian War of 1866. Various important towns, cities, rivers, mountains and several other topographical details are noted with relief shown by hachure. This map was engraved by Sidney Hall and issued as plate no. XXII in the 1851 edition of Black's General Atlas of the World. Rumsey 2305.029 (1854 edition). Philips (atlases) 4334.